Meriton Suites Church Street, Parramatta is located in the thick of the action. Situated on Parramatta’s lively “eat-street” next to the Parramatta River, our apartments provide an excellent base for exploring, shopping and dining. Surrounded by an abundance of entertainment venues, delicious eats, and leading sporting grounds as well as corporate head offices and government departments, we are the ideal location for whatever your visit entails. 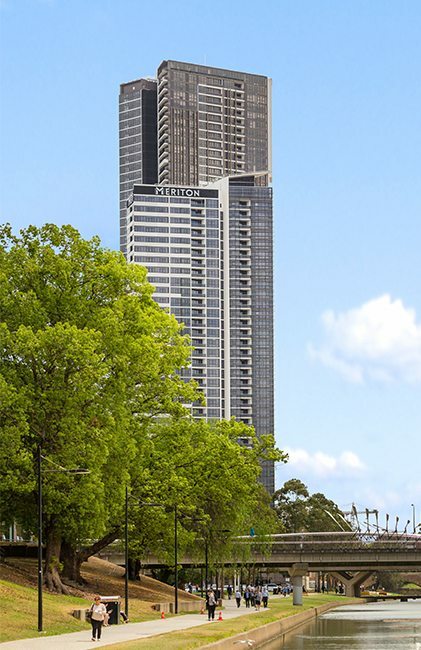 Soaring over the banks of Parramatta at an impressive 36 levels tall, we offer Parramatta’s only 5-star luxury accommodation in Western Sydney’s tallest hotel. It wouldn’t be a stay at Meriton Suites if we didn’t feature the luxury Meriton standards of meticulously designed suites, in unmatched locations with the unprecedented views we’re famous for. Boasting the finest of furnishings, spacious living areas, well-equipped gourmet kitchens, and internal laundry facilities, this new ultra-modern apartment-style hotel showcases exquisite river views leading east towards the iconic Sydney city skyline. All our 254 suites are up to three times bigger than a typical hotel room. The 2 and 3 bedroom suites cater to all family sizes and groups, with the inclusion of extra benefits such as a full second bathroom and additional flat-screen televisions in every bedroom. We proudly also offer rooms that are slightly modified to help accommodate guests who are wheelchair bound. The hotel also includes the latest state-of-the-art recreational facilities, of course, where you can maintain your fitness regime in a 24-hour accessible fitness centre. Or cool off in an indoor lap pool, spa and sauna after a busy day. Better yet, this hotel is one of the few to also have an outdoor podium pool, where you can enjoy laying in the sun poolside, overlooking Parramatta River. Designed with both business and leisure travellers in mind, all our guests are able to stay connected with complimentary hi-speed Wi-Fi, accessible in all areas of our hotel including your suite. Feeling the need to unwind in your room? All your entertainment needs are at the touch of your fingertips with a range of Foxtel channels including sports, news, movies and documentaries complimentary on all flat screen TVs within the suite. Whether you’re heading to a concert or sporting match at ANZ stadium, are a corporate guest, or are here to grab a bargain at Australia’s busiest Westfield Shopping Centre, Meriton Suites Church Street, Parramatta will exceed your expectations in comfort, convenient and luxury living. The convenient location is only surpassed by the outstanding facilities and the immaculate rooms with exceptional views. Your stay will be truly unforgettable. Parramatta is a city rich in history, arts and culture. With a world-famous culinary scene, excellent public transport facilities to get around, great parks for the whole family to enjoy and host to major festivals and sporting events. As the second largest business district of Sydney, and the sixth biggest CBD in Australia, Parramatta is a bustling hub of activity with something to enjoy for everyone. Whether it’s business or leisure that leads you to stay, you deserve stylish and affordable accommodation in a great location. Can I book a car parking spot? Now in partnership with Deliveroo, we are able to offer an extensive choice of meals from a selection of nearby restaurants; with all the choices growing by the day. Just like other hotels, ordering has been made as simple as a phone call down to our Guest Services team. There is also a selection of restaurants directly underneath our hotel which is part of the same complex. What if I arrive early at the hotel can I check-in?